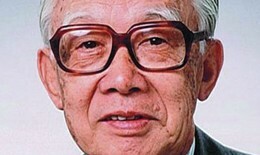 Masaru Ibuka is renowned as a pioneer of electronic products and the co-founder of Sony Corporation. Ibuka was born in Japan in 1908 and attended the School of Science and Engineering at Waseda University, graduating in 1933. He worked at the Optico- Acoustical Engineering Company as the Chief of the Radio Section from 1937 to 1940. He was then appointed Managing Director and Chief Engineer at the Japan Measuring Instruments Company. In 1945 he formed a radio repair shop in Tokyo, before being joined by Akio Morita the following year. They co-founded Tokyo Telecommunications Engineering Corporation and went on to build the first Japanese tape recorder. In the early 1950’s, Ibuka helped secure Bell Labs licensing transistor technology, which would become crucial in Sony’s technological developments. In 1958 they changed the company name to the Sony Corporation and revolutionised technology with the creation of such products as the transistor radio and video recording. Ibuka served as President from 1950 to 1971 before becoming Chairman and later, Honorary Chairman in 1976. He retired from the Sony Corporation in 1976 but continued on as an adviser until his death in 1997.